How important was the use of violence in helping Hitler to become dictator in 1934? No one expected Hitler to rise to power. He had failed at just about everything he had undertaken until he discovered politics. Eventually Hitler became chancellor in 1933 but becoming chancellor was not enough for Hitler he was determined to become dictatoras quickly as possible to begin the Nazi revolution. Hitler went a long way into getting what he wanted and in august 1934 Hitler became Dictator in Germany. Hitler had used many different tactics in order to become dictator most of which relied on his position in government, chance, persuasion and political violence. But was Hitler’s use of violence important in securing him the role of dictator? Or was it something else? During the years of 1933-1934 Hitler had taken control of Germany. There are many ways in which violence had succeeded in helping Hitler to become dictator. The use of violence became a way of life for Hitler and the Nazi party. On 27th February 1933 a key event took place for Hitler and the Nazis, the Reichstag fire. It is believed that Hitler and the Nazi party planned the Reichstag fire and threatened the communists to admit responsibility for the fire; this incident gave Hitler the excuse he needed to ban the communists from the Reichstag. A Communist was framed for the bombing of the Reichstag; Hitler convinced people that the communists were trying to take power. Therefore he convinced the German government and the public to go against the communists. The Nazis immediately banned them from taking part in the election. Hitler used the Reichstag fire to create a panic that made it easy for him to extend rule by decree. This shows that violence had been successful to Hitler as it enabled him to ban the communist, the party which had been a threat to the Nazis, Gaining himself more seats, power, and it enabled Germany into dictatorship. Hitler was granted the enabling act; this law was then used to make the "Law against the New Formation of Parties" it banned all other political parties and made Germany a one-party state, and completely legally. Only Nazis were now allowed to site in the Reichstag. They also banned people from forming new parties. The law against formation of new parties used violence as SS & SA surrounded the building to intimidate politicians and the Nazis intimidated voters by watching over them as they crossed their ballot papers, and any enemies of the Nazis, especially communists were executed or were arrested and sent to concentration camps such as Sachsenhausen for 'crimes' as small as anti-Nazi jokes, writing anti-Nazi graffiti, possessing a banned book, or saying that business was bad. This helped Hitler on his way to dictatorship as there was no more opposition from other parties and people who were against him, the only thing standing in his way of dictator now was President Hindenburg. Another use of violence which had help Hitler to become dictator was the night of the long knives. For Adolf Hitler, the behaviour of the SA was a problem that now threatened his own political survival and the entire future of the Nazi movement. Hitler now had to deal with the opposition in his own party. Hitler had been convinced the Rohm was a threat to his position and decided that he had to die. The night of the long knives took place on the night of 29th June 1934 and saw the wiping out of the SA's leadership and others who had angered Hitler in the recent past in Nazi Germany. They were terrorized and beaten. Hitler ordered SS members to kill SA members and Rohm, 1000 SA members were killed including Rohm. For Hitler the night of the long knives was a triumph. This shows that violence had helped Hitler as he was able to get rid of his last remaining opposition within his own party. Therefore leading him into the way of dictatorship. Another act of violence to secure his dictatorship was the oath of loyalty. As soon as Hitler became dictator he made all members of the SA and Nazi party to sign the oath of loyalty. This was seen as an act of violence as Hitler forced, threatened and intimidated people into signing the oath otherwise he would send their family into concentration camps. This had frightened many members because they did not want their families to be sent away, so many signed in fear. This shows that overall Hitler was able to become dictator through the act of violence. However it was not violence that helped Hitler to become dictator, there were many other ways in which he succeeded without the use of violence. A main event which helped Hitler was the enabling act. The enabling act was signed 24 March 1933 it Gave Hitler emergency powers to pass laws without the Reichstag. Hitler could rule alone for 4 years pass any law he wanted. This was very important as it had given Hitler complete control and supreme power. Under the enabling act the Jews were stripped of all rights, trade unions were broken, and rival parties were made illegal. In addition, Hitler began to isolate Germany from the rest of the world. They achieved what Hitler had wanted for years - to tear down the German Democratic Republic legally and end democracy, therefore paving the way for a complete Nazi takeover of Germany. This shows that the enabling act had helped Hitler as later on he was able change certain rules which then allowed him to take full power of Germany as dictator. Another factor which helped Hitler to become dictator was luck and persuasion. Hitler was able to manipulate the government and get whatever he wants.President Hindenburg had fallen under Hitler's spell and was signing just about anything put in front of him. This had helped Hitler to become dictator because the government and Hindenburg were agreeing with everything Hitler needed in order to become dictator. The final event that allowed Hitler to become dictator was the death of President Hindenburg on the 2nd august 1934. Hitler was now finally able to take his position and had now definitely got rid of the last person standing in his way of dictatorship. Hitler declared himself to be Der Fuhrer (The Leader) of Germany. 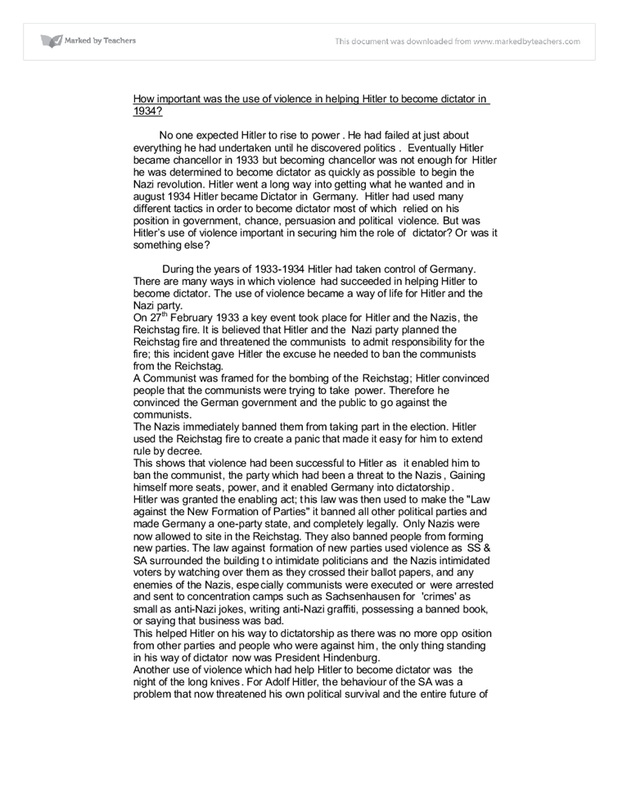 This shows us that the use of violence did not help Hitler to become dictator because no use of violence from Hitler or the Nazi party was used in connection to Hindenburg’s death or the enabling act. This shows that Hitler became dictator through his position in government not violence. In conclusion I think that the use of violence was extremely important in helping Hitler to become dictator because violence and terror had given him authority and power in Germany, which made the German public and government fear him so they gave in to his demands and policies. Violence also helped Hitler as he managed to silence his enemies including the communists and Rohm. Violence had built up his character as Der Fuhrer and made him seem invincible. 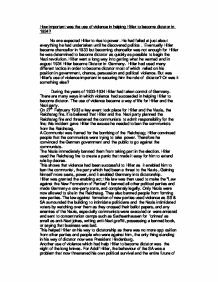 Nazi Germany - who supported Hitler and how did he become a dictator? Thr opposition of the Church. To What Extent Had Hitler Legally Achieved A Dictatorship in Germany by 1934? He also dissolved the Prussian parliament, which effectively gave Hermann Goring control of 60% of Germany's police force. The police support of the Nazi Party was the backing for a violent terror campaign against other political parties, again particularly against the KPD. The Putsch helped Hitler eventually come to power in a number of ways. Firstly the trial received massive media attention, as this sort of thing was rare in 1923. This meant that the Nazi party were brought to the attention of Germany, as they were virtually unknown at this point. had the job of enforcing the Nazis policies in the provinces and cities. Giving Hitler total controls and influence on the whole of the Germany. This meant there would be no resistance, local government would definitely implement all his laws. This group gained its foothold in the United States in 1913 when it took over control of the United States currency by establishing the Federal Reserve Bank. They went on to finance the Russian revolution, WWI and WWII. All of these were necessary steps on the path to a one-world government. After the depression, there was a serious shortage of national pride - any kind of pride for that matter; and being in uniform brought some of that back. The Gestapo, set up in 1933 by the Prussian Minister of the Interior, was the German secret police. To eliminate political competition, ?Law against the Formation of New Parties? was instated on 14 July. It forced political parties other than the Nazis to dissolve themselves and banned the formation of new parties. As the Nazis were the only legitimate party left in Germany, Germany became a one-party state. To counter this, he set up the SA, also known as storm troopers or brownshirts in 1921. These hired thugs protected Hitler?s meeting but also disrupted those of his opponents. By November 1923, Hitler was of the opinion that the time had come for him to overthrow the Weimar government.